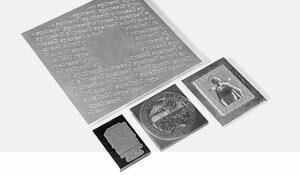 Stoma GmbH sells into many countries special Revere printing plates made by zinc, magnesium, copper and brass. There are coated and uncoated plates. All plates will be used in embossing, security printing, blind printing and flexography. Material: Presensitized magnesium-plates with “Magenta”-coating for dissolver-development or “HydroCoat” and “HydroSolve” for water-solution developing.